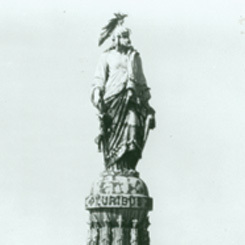 Image courtesy of Library of Congress On top of the Capitol Dome, the Statue of Freedom faces east away from the National Mall and the White House. On this date, Captain Montgomery C. Meigs, supervising engineer of the Capitol expansion, received the conceptual drawings from Thomas Crawford, an American neoclassical artist, for the Statue of Freedom. The statue was to be the crown jewel of the dome atop the Capitol Rotunda. The second sketch of the statue featured a woman with a liberty cap. When Secretary of War Jefferson Davis objected to the allegorical allusion to a freed Roman slave, the artist revised the drawing to feature a statue with a helmet. Although construction on the dome began in 1856, the dome and its final accouterments were not in place until December 2, 1863. Freedom’s story contains an ironic twist; a slave named Philip Reid played an integral part in placing Freedom atop the dome. Earlier, a contract dispute had threatened to halt the project’s progress until Reid determined how to complete the complicated casting of the statue. As a result, he oversaw the remainder of the its construction. To commemorate the completion of the statue and its crowning of the dome, officials organized a ceremony with a 35-gun military salute echoed by salutes from the 12 forts ringing the federal city. The first Republican Conference Chairman, Justin Morrill of Vermont, introduced the resolution to create Statuary Hall in the U.S. Capitol.